Windows – it as a very important exterior and interior element , which greatly affects Your aesthetic style of house, as well originality, quality of life, comfort and safety. Therefore, it is important to choose consistently and responsibly. Plastic windows can perfectly protect the heat, as well are durable, easy to maintain, it can be in various shapes, colours and textures. From the first view, you will hardly separate them from wooden or aluminium. All you need to do is to choose the most suitable and likable windows, and we will ensure that your home will be a warm and safe place! 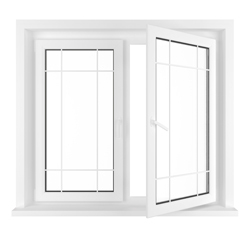 The „Corona SI 82″ plastic window systems have a three sealing planes and a normal steel frames. Therefore, today acceptable windows for the passive low-energy houses due to advance technologies and a wide range of profiles, can be made with a lower cost and as well can meet the highest requirement standards. This system with a supportive gum base – 6 cameras technology. Tho original „Corona SI 82″ skylights – „Rondo” and „Classic”, are available that will accentuate your buildings individual style. How to realise the planned construction work in the optimal way due to make a result a beautiful and inexpensive? Choose the „Corona CT 70 Plus” system and you will be satisfied with the result. The plastic window system with exterior aluminium decoration meets the extremely high aesthetic requirements and gives the originality to the building facade. The inside of the „Corona CT 70 Plus” is a 5-chamber technology with universal plastic window system, featuring a high level of thermal insulation. The three original „Corona CT 70″ contours of – Cava”, „Rondo” are available that will accentuate your buildings individual style. Window colour – you can choose from 40 different shades.